It was an exciting day in solar car raycing. The team has continued well along the bumping route 66 without any problems until just before pulling into Sayre, OK checkpoint. Once we got into the checkpoint and examined the chassis we noticed that the upright on the motor mount had caused a crack in the carbon fiber panel that it was attached to it. This was unexpected but yet the team quickly bounce into troubleshooting mode and with the assistance and guidance of Dr. Starr, were able to make a structural repair in about 1.5 hours. 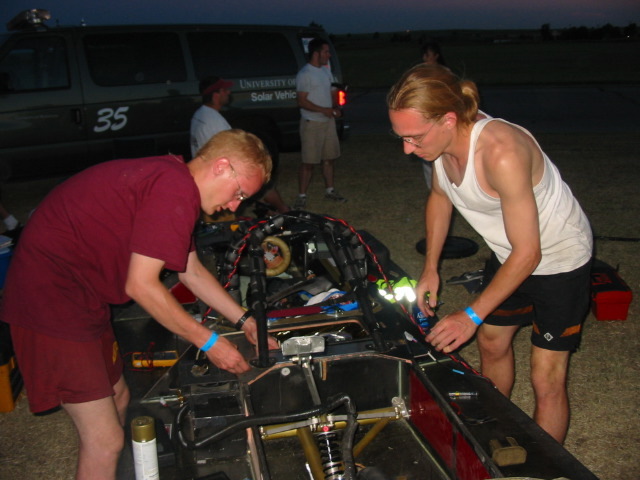 By the time we finished the repair and left the checkpoint, Principia, Queens, WMU, and Mizzou had left. As soon as we left, we ran hard in an attempt to reach Amarillo, TX. To our surprise we caught up with WMU and ran behind them for some time. Once we crossed the Texas border we realized the roads were extremely straight and long between stops (great news for Borealis II). In a lucky move, we switched to the left lane as we approached a stop light, in which we found WMU waiting for the green on. This turned out to be the correct choice because the light turned green just as we arrived and allowed Borealis II to zip past WMU and Mizzou who was (to our surprise) just in front of them. Once past we did not look back. At 6:06pm, we stopped on the side of the road in a nice flat open area in a small town in Texas. We are currently working to polish our repair job and get Borealis II ready for tomorrow. Wish us luck, Hope you enjoy the updates. We stopped for the night on July 16th in McLean, Texas at the Cactus Inn on Route 66 and proceeded to setup the array to charge our batteries. Many local folks stopped by to examine the car and talk to the team members. 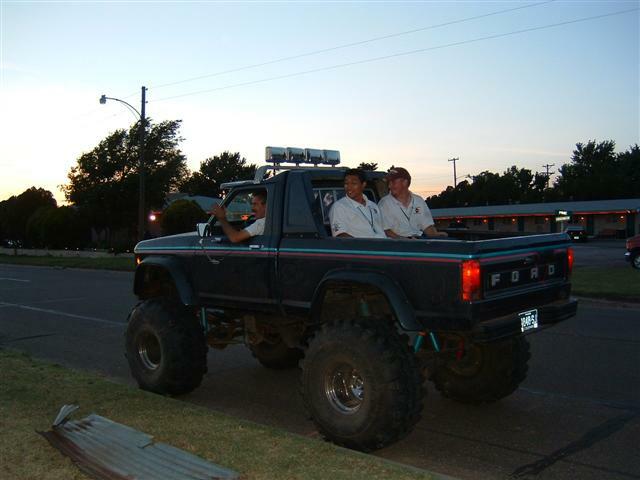 One visitor, Butch Warner, stopped by in his high-boy truck with 44 inch diameter tires. He hung around for a few hours, sharing not only his enthusiasm for vechicles of all flavors, but provided much-needed entertainment for our exhausted team, by giving rides in his truck. He took the team members, including Dr. Starr over 15 foot tall dirt mounds. In special appreciation, the team has decided to include Mr. Warner, the proprietor of Window Auto Supply in McLean, Tx as a team sponsor. Thanks for the good times!